With a passion for painting and carpentry serving as the catalyst, a part-time venture began in the early 1980s, and has transformed into a full-time operation known as, Pro-Paint Plus, in January 1988. Now, 25 years later, we and the professional staff at Pro-Paint Plus, continue to share the same commitment to quality. This is our brand, and our standards and level of commitment do not fluctuate with the times. Our ultimate goal is to give our customers the best return on their investment. Rather than being a one-time contractor, who zips in and out of your home, we take a “whole house effect” approach, when looking at a project. We find out your goals, look at the project and discuss ways to make it the best it can possibly be. Our customers have found that this approach gives them a result that is not only pleasing to the eye, but significantly adds to the value of their home. In addition, as members of the U.S. Green Building Council, we can show you how using sustainable building concepts can make your home more energy efficient, environmentally friendly and easy to live in. 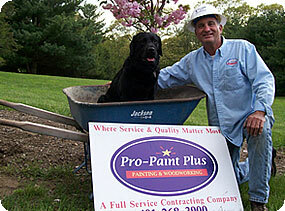 At Pro-Paint Plus, we have focused on developing a loyal base of lifelong clients. We understand that this loyalty can only be earned through both the quality of our workmanship, and the conduct of our staff. Thomas and Carol Marsocci invite your questions, and request for a free quote. Contact us, today. Proper planning with the customer before the project starts - We get to know you and your home, ask all the right questions concerning the project and your goals, and work with you to determine the best course of action. When that process is completed to your satisfaction, you will receive a written step-by-step contract, which we can all understand. Trained and screened professionals on the job - Our staff and any contractors must meet our stringent standards, before we’ll send them to your home. When it comes to commitment to quality, we are all of the same mindset. We carry full worker's compensation and liability insurance on all our workers - You never need to be concerned. Direct contact with the company's owners - If you have any questions or concerns, Thomas and Carol are here to provide the answers. Product and application guarantees - We stand behind our work. We use only high quality products on our jobs. Co-owner, Thomas Marsocci, Jr., is the former President of the Ocean State Painting and Decorating Contractors of America. Ultimate service and customer satisfaction is our company goal.